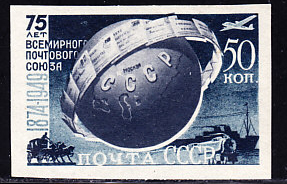 5651 VAR RUSSIA (1949) Globe encircled by letters*. Imperforate with shift of globe revealing a white space. Scott No 1393a. UPU 75th anniversary.